When we were holding fragile, baby Patrick those words became our mantra. It was all we asked for from each other, all we expected of our kids, all we hoped for the world to give our son who was labeled with "down syndrome", "mental retardation" and assorted other limiting words sprinkled on him only hours after birth. And like some sort of slide show, I remember the incredible acts of kindness bestowed in those beginning days. I remember returning from the hospital to a house still in the ruins of a remodel to a front door that was decorated and welcoming us home. That loving act of kindness still brings tears for it was the first time that I pondered the idea that Patrick might be welcomed by others...and he was! I remember a dinner being brought over to my house by a mom I didn't know since Jack was a brand new kindergartener and we were new to our town. Mostly, I remember the bottle of wine she gave us...as if we were celebrating. And it dawned on me that we could be celebrating, should be celebrating -- instead of being afraid of the unknown. I remember vividly our gentle, kind parish priest, Father Dan, holding tiny Patrick right outside of church and giving him a blessing and then blessing all of us. I could feel his grace and his welcoming kindness. I remember a friend coming into our hospital's Pediatric Cardio Intensive Care Unit with a giant over-sized stuffed puppy that was also named Patrick. Seeing that giant puppy given from my hard-working friend in her business suit made me believe that someday our Patrick might be climbing all over that silly guy and having fun...outside of hospital walls and hard times. And no, it's not just in the intense dark days that this matters. Kindness matters every single day. It is the extra deep breath and calm reaction to whatever mishap in the kitchen has occurred -- the proverbial spilled milk. It is the extra thirty seconds of listening to someone speak, really listening. It is the way we say goodnight and the way we say good morning to those who share our space. It is the smile of recognition and welcome for someone who's new. It is the caring text, checking in. It is the phone call, the dinner served, the extra kid who tags along because he needs a ride too. It's our reaction when our spouse says he's got to go out of town, yet again. You see, I'm not writing this to tell you I'm doing all this. I'm writing to remind myself. To remember what it feels like to receive such kindness and by remembering trying to live it. It's a process and a slow one...but that song still rings true today. Perhaps the words are even more important today. Piggybacking onto Jewel's song is this poem...one of my all time favorites. It, too, serves as a daily reminder for me. So, it is with kindness that I send this out to you...hoping the ripples will make their way into some space within you that needs a bit of kindness...hoping that those ripples will continue to find others who need a dash of kindness like they need a spot of tea. That this kindness can be the way we treat each other, including those that we love most and those we don't even know. The "size of the cloth" is pretty big, and it is the only thing that makes sense. This...just never gets old, does it? I don't know who taught her this. This smiley face tucked inside the letter "O" but I absolutely love it. And trust me, if I could somehow place two eyes and a curvy upward smile into my computer "O" I'd be all over it. 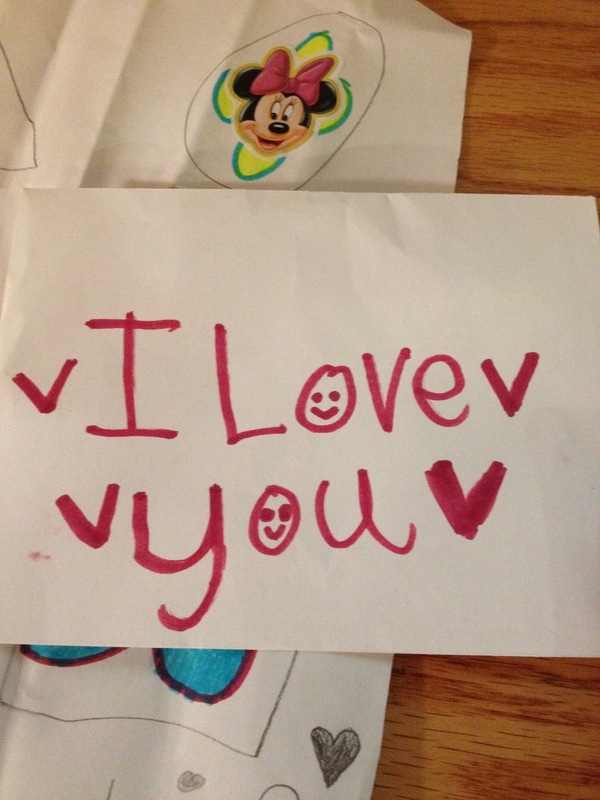 I received this envelope just the other day -- at the end of a long day. I perked right up with those smileys. I started thinking about where she might have seen those decorated "O"'s and wondered who was blessing her with smileys, besides me. Back when Patrick was in kindergarten, in 2005, I decided to travel to Sioux Falls, South Dakota for a conference for educators who believed in full inclusion in Catholic schools. It was the first time I had ever really travelled alone and I was going to a place where I knew no one. It was a whim. I felt an urgent need to affirm to myself that including Patrick in our local Catholic school where our other two older children went wasn't just a nice idea. I wanted to believe that it was happening in other places. I wanted to meet other people who felt called to this mission of actually living what we know at our very core: all kids deserve to be educated together -- no matter how hard or uncomfortable it might make the school community. We all deserve to sit at the table. So, there I was on an airplane journey that had a layover and a long wait in an airport. You should know this about me, and perhaps you do, I'm a talker. I love to strike up conversations with strangers. I love hearing their stories, commiserating over cold coffee or weird TSA agents or sharing the latest book I'm reading. I am comfortable making small talk, actually, I'm good at it. So it might come as a surprise when I reveal that for two different airplane rides, one multi-hour layover in a strange giant airport not a single person made eye contact with me or made conversation with me. It was so unnerving that on the second leg of my journey I started to have real doubts about this whole thing. "Beth, what in the world are you doing?" "Why are you traveling all the way to South Dakota on a lark?" "What are you thinking leaving your three small children and your husband and just going off -- this is crazy!" Honestly, by the end of that second plane ride I had convinced myself that if my ride to the tiny (yet gorgeous) retreat center way out in the boondocks of rural Irene, South Dakota looked at all suspicious I would just pack it all in and declare failure. Off the plane I went searching for my ride and there he was: an older man with a kind smile holding a sign. All it said was Welcome -- NICE Conference. And in the center of those two letter "O"'s were, you guessed, the smiley face. It sounds funny now but as soon as I saw those smileys I knew I was in the right place. I knew I was with the right people and I knew it was going to be a worthwhile adventure. Seeing how the world is right now with outrageous hatred toward others of different cultures or faiths or classes I want to start a worldwide smiley revolution. I'm not trying to be trite or trivial. Can you imagine how powerful it would be if we all just held up signs that said "Welcome" with a smiley in the center? How sinister can we be if we hold up signs that say "love" with a smiley tucked in there...how about the powerful "Thank you"? I believe we could change the world with a smiley revolution. If every single person received a smiley, regardless of status or age or wealth or race, we could change a worldwide mood of hostility and simmering anger to one of care and inclusion. Hey...how about the word "inclusion" holding that smiley too??? Yep, we all deserve to be here. We all deserve a smiley and while we're at it, let's throw in a heart or two. It can't hurt and it just might help. Your job today: pass out 10 smileys and 5 hearts to those you love. Tomorrow pass out the same amount to strangers. The next day: try to pass them out to those who you'd rather not give them to, those who bug you, get under your skin or make you creep out. Thirteen years ago God graced us with a baby...a tiny baby boy with a broken heart and an extra chromosome. The doctors who know better checked his heart immediately and found that indeed Patrick had one large chamber when he should have four. We were introduced to fancy terms and potential surgical procedures and a whole host of predictions that just don't seem to fit into your brain when you are holding a tiny piece of perfection. Predictions that included "heart failure" and "open heart surgery" in a matter of weeks. I remember watching him breathe effortlessly still sleepy from entering this crazy world and wondering how any of it could be true. Like a small child, I leaned down close to his chest and tried to hear anything that might indicate the dire predictions...I always wonder what I expected to hear (an ambulance siren? a tornado warning?) but all I heard were the sweet sounds of a baby slumbering, perfectly at peace. My world was the opposite. I grappled with a newborn facing massive surgery at any moment -- the date depended on the best guess of a pediatric cardiologist who acted casual and perfectly normal as he described cracking my newborn's chest open, cutting through the electric field within the heart, creating chambers with Dacron patches and reconfiguring life sustaining heart valves. Sure. No problem. It's all fine, really...NOT. On 9.9.99 at 9am at 9 weeks old and 9 pounds 9 ounces, I handed my sweet baby over and prayed like crazy for the next few hours. Anything goes with heart surgery. All sorts of really bad things can go down. We all know it but nobody talks about it...until it happens. Believe it or not, this was a time before the internet and incredible connectivity was really possible. I knew next to nothing of what to expect. I saw no pictures of babies who might have gone through something similar. I didn't know what would happen afterward or how nursing would go or if I would ever get my baby back. tentacles that gripped me. I got good at finding my way to random isolated corners of the hospital and crying and crying and crying...as if that would help. Patrick for the first 18 hours was really out of it but then the pain came crashing down. They tried the heavy narcotics that relieve almost anyone else, increasing the morphine regularly but it didn't work. An entire day later, they tried Fentanyl and my baby finally stopped fussing. To this day, that drug is emblazoned on my memory and should Patrick ever be in severe pain again I know what to say and how quickly to act. It doesn't help that now I know that he has an incredibly high pain threshold and that when he is suffering, he really is suffering, in an excruciating way. For five days, Patrick recovered. But those words mask the terror and the fear. We watched a young boy who was Jack's age at the time -- a darling six year old -- die right in front of our eyes with every amazing surgeon and doctor and nurse laying it all out there to save his life. It wasn't supposed to go that way. It wasn't expected. And it's moments of complete futility and heartbreaking effort that underscore what we all know but never acknowledge: all the important stuff is out of your hands and out of your power. All you get to do is wait, hope, pray and acknowledge the gift if it goes your way. So...every September 9th we pause and acknowledge the gift. It went our way. Those Dacron patches worked. Those valves continue to do their job day in and day out. Thirteen years later, I have a teenager with a scar on his chest -- his badge of courage we call it -- and that is it. No heart issues at all. We had talented surgeons, truly terrific nurses and nothing but good fortune on 9.9.99. 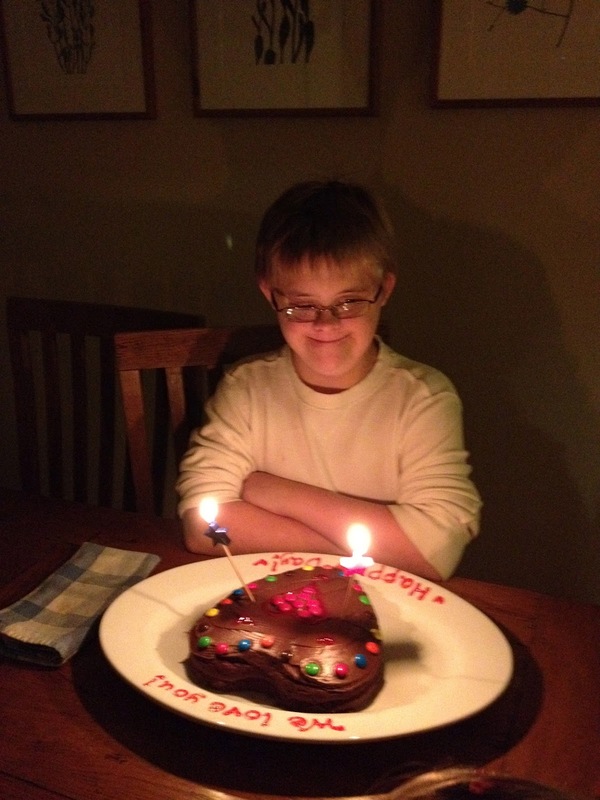 It seems the least we can do is make a heart cake, dig out the red plate and celebrate Patrick's lucky number nine. My boy with the biggest heart I know can indeed see rightly. He knows what is essential. Thanks to him, I do too.